Create and design your own photo book that will hold every memorable moment inside and out. 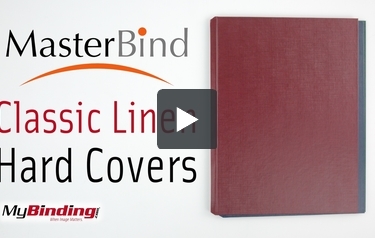 Prevent any smudges with the heavy-duty and durable MasterBind Classic Linen Hard Covers. When you lay your hands on the covers the instant satisfaction of the premium quality will immediately register. The 11" x 8.5" Burgundy Classic Linen covers display a traditional and smooth album presentation, with multiple color selections, personalization is just step one. Whether it's a cover for a photo book of weddings or the first born, MasterBind Classic Linen will ensure the highest quality that captures every first kiss and each single baby steps. Welcome to MyBinding Video. These are the Classic Linen Hard Covers from MasterBind. These hard covers give your books a classy, premium finish. Under the light, you can see the linen texture in the intersecting threads. In your hand the texture grips your fingers and doesn’t show smudges or fingerprints. These covers work perfectly with MasterBind binding spines and machines. These covers are available in red, blue, green and black, all in boxes of 20. For more videos and all your binding needs, visit MyBinding.com.